SANTA CLARA, CA – – March 19, 2018 — Bramasol, the leader in Revenue Recognition solutions, has announced a new, purpose-built product that reduces complexity and gives companies across a variety of industries a ready-to-deploy turnkey solution for disclosure reporting and compliance. 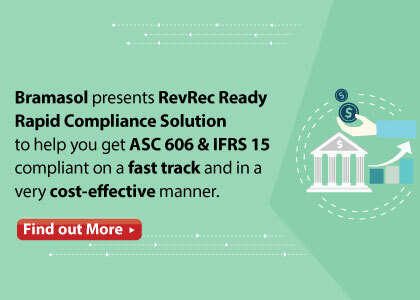 The RevRec Ready Rapid Compliance Solution leverages the power of SAP RAR and combines it with Bramasol’s deep experience to provide a quick start that can get companies up and running in weeks instead of months and for an affordable price. This complete, ready-to-deploy approach gives CFOs a proven, fast and reliable way to meet RevRec compliance requirements without the risk of getting stuck in a long, open-ended process that might not yield the desired results. The deadline to get compliant with ASC 606 and IFRS 15 has passed but many companies are still struggling with complex reporting requirements. Many companies with relatively straight-forward sales structures and simplistic multi-element products/services don’t want or need to become mired in overly complex RevRec solutions or long implementation processes. But compliance with the new standards is NOT optional, so they need a risk-free solution that fits their specific situations. Bramasol is the Revenue Recognition leader and a recognized SAP Revenue Recognition services partner for companies seeking to comply with and benefit from the new Rev Rec standards. Our SAP-certified experts, partnering with SAP, assisted in the majority of SAP Revenue Accounting and Reporting Ramp-Up projects. Driving successful workshops, Proofs of Concept, and implementation projects throughout the U.S., Bramasol is the go-to partner with the experience and expertise for companies wanting to leverage SAP Revenue Accounting and Reporting to comply with ASC-606 and IFRS 15 as well as ASC 842 and IFRS 16 for leasing. Are you #RevRecReady?